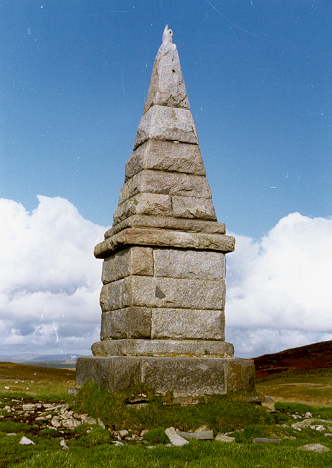 The obelisk was erected in 1843. It has a carved hand pointing heavenward as its finial. Nearby, in a walled enclosure, is a flat tablestone marking the graves of the Covenanters.This had been repaired in 1823. Captain Andrew Bruce of Earlshall killed four Covenanters at this spot on 2 March 1685. 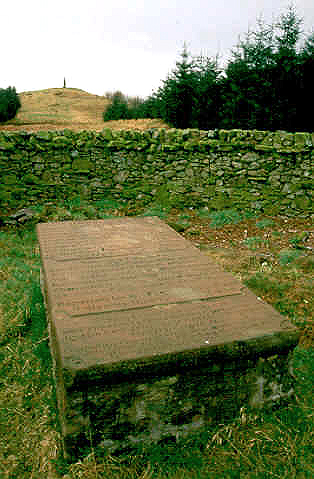 Two other Covenanters - Edward Gordon and Alexander MacCubbin - were taken prisoner and subsequently executed at Kirkpatrick Irongray. Two more were captured and banished abroad. One of these was another Robert Grierson, tenant of Lochenkit farm (NX 790771), who managed to return home in 1688.The four martyrs were John Gordon, William Heron, William Stuart and John Wallace. Heron belonged to Glencairn parish, the other three were from Galloway.